Each Spring, Austin welcomes the international community of artists and industry professionals by hosting one of the biggest music, film, and interactive festivals in the world–South By Southwest (SXSW). Even with a year-round staff committed to building and delivering the conference and festival, there is simply not enough manpower to go around. With about 29,000 registrants, an event this large requires thousands of people to make it possible. 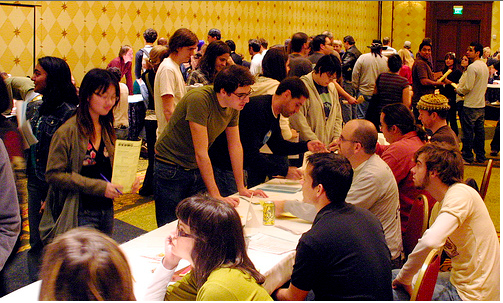 In order to entice individuals to help out, SXSW offers passes, or “perks”, in exchange for a certain number of volunteer hours leading up to, and during, the festival. This is a great incentive, considering passes to SXSW run anywhere from $300 for student passes to upwards of $1,000. According to SXSW staff, there are still opportunities available, although many of the crews have been filled. Volunteers can still work on one of two crews: Conference or Music Production. Conference volunteers may schedule to work shifts anytime throughout the ten days of the festival (March 12-21, 2010). Conference volunteers work toward earning a perk of their choice based on an hourly point system; the more hours a volunteer works, the bigger the perk. This option offers more opportunity to spread the hours over a ten day period. Music Production volunteers work a minimum of three nights during the Music Festival (March 17-21, 2010). Unlike conference volunteers, music volunteers work towards the perk of their choice based on the number of shifts that they work. All shifts are during the evening, so this is a good opportunity for someone who works during the day and may not be able to get time off work to volunteer. is located at 1007 E. 40th Street, Austin, Texas 78751. The office is open Monday – Friday, 11AM to 5PM. For more information, visit the SXSW volunteer website at http://volunteer.sxsw.com/.